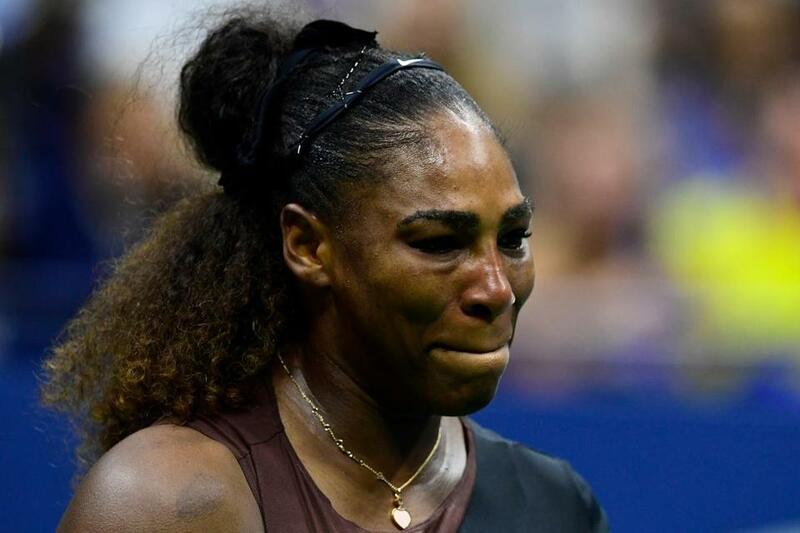 Serena Williams reacted in the second set after a heated argument with the referee, who penalized her a game in the championship match of the US Open. 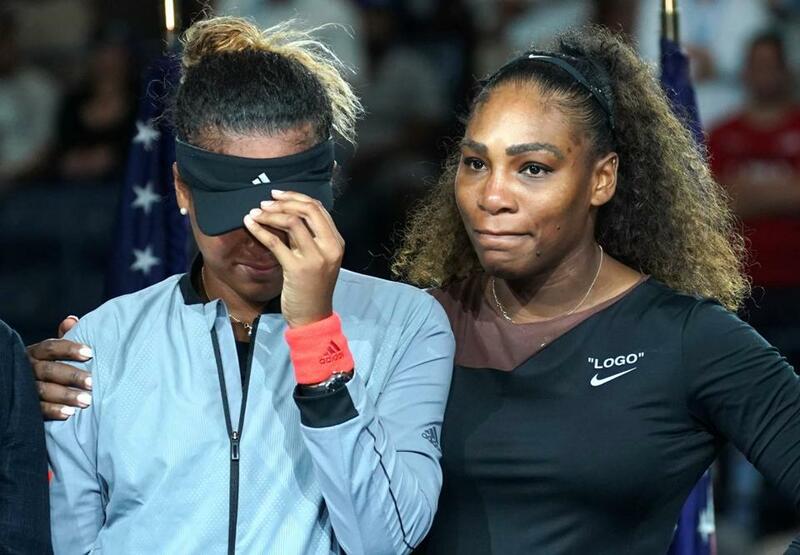 NEW YORK — Serena Williams was penalized a game for calling the chair umpire a thief during an extended argument as the US Open women’s final descended into chaos, with fans booing and play delayed before Naomi Osaka wrapped up a 6-2, 6-4 victory for her first Grand Slam title. The biggest issue for Williams on the scoreboard Saturday was that she was outplayed by a younger version of herself in Osaka, a 20-year-old of Haitian-Japanese ancestry who was raised in the United States but plays for Japan and who idolizes the 36-year-old American. King responded to the controversy involving Serena Williams and umpire Carlos Ramos in the US Open final. Williams objected right away, saying she would never cheat. After the match ended, in an interview with ESPN, Williams’s coach, Patrick Mouratoglou, acknowledged he had tried to signal Williams, but said he didn’t think she had seen him — and added that he thinks every player gets coaching during matches. Briefly, Williams appeared to be working her way back into the match, breaking Osaka for the only time to go up 3-1 in the second set. But Williams played a poor game right after that to get broken immediately, and she smashed her racket on the court, destroying it. That drew a second code violation — and, automatically, cost Williams a point. Serena Williams, winner of 23 Grand slam tournaments, supports Naomi Osaka (left), after she won her first, the US Open. When she realized that the next game had started with Osaka ahead 15-love, Williams told Ramos he should have retracted the initial warning for coaching. It was the second Grand Slam final defeat in a row for Williams, after Wimbledon in July, as she seeks an initial major title since returning to the tour after having a baby in 2017. She missed the US Open last year, because her daughter, Olympia, was born during the tournament. 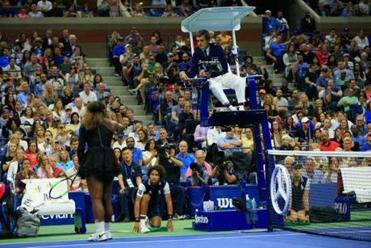 ‘‘There are matters that need to be looked into that took place during the match,’’ the WTA said in a statement. Osaka won the first set, 6-2, running off five straight games after Williams held serve to open the match. It was another dominant start for Osaka, who had dropped just one set en route to her first Grand Slam final. Williams was playing in her 31st career Grand Slam final. Osaka became the youngest US Open champion since Maria Sharapova was 19 in 2006. The final was played with the roof closed. Tournament officials said that because of a high probability of rain from the afternoon through evening, the roofs at Ashe and Louis Armstrong Stadium had been closed and would stay that way for the remainder of Saturday’s play. Earlier, Jamie Murray won his second straight US Open mixed doubles title, teaming with Bethanie Mattek-Sands to beat Alicja Rosolska and Nikola Mektic, 2-6, 6-3, 11-9. Murray won last year with Martina Hingis and she was in the box Saturday to cheer the doubles team at Arthur Ashe Stadium. Murray became the first man to win consecutive US Open mixed doubles titles since Bob Bryan in 2003 and 2004. The 32-year-old Murray, brother of former Wimbledon and US Open champion Andy Murray, played with Mattek-Sands for the first time in the tournament. Mattek-Sands has also won mixed doubles Grand Slam titles at the Australian Open and the French Open. Murray had three other Grand Slam mixed doubles titles. Rosolska and Mektic also played together for the first time in what was the first all-unseeded doubles final at the US Open since 2009.